To those who know her, my friend Yang Riches is admired in Bangkok social circles for her classic elegance and ageless style. Tall and slim, she loves fashion and always looks great in well-cut designer ensembles or street cred skinny jeans ( you would never see Yang in mom jeans, no no no!) , with tasteful luxury accessories that invariably includes a Cartier watch. While she loves clothes, her real passion is for jewellery, especially one-of-a-kind pieces and bold gemstones. Yang’s keen eye for unique jewellery was even featured in an International Herald Tribune article about Bangkok jewelers some years ago, before she became a designer herself, and was someone who loved bespoke jewellery. 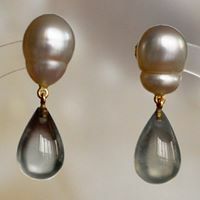 She created her own line, Yang Riches Jewellery, which is instantly recognizable for her exquisite use of raw gems, uncut crystals, baroque pearls, hammered 18 karat gold, and superior craftsmanship. Chunky rings and drop earrings are her signature pieces. Her designs are inspired by her love for nature. Yang Riches Jewellery has been exhibited at private trunk shows in London, Bahrain, Singapore and Thailand, and is sold in luxury hotel boutiques around Thailand, and by private appointment in Bangkok and London. 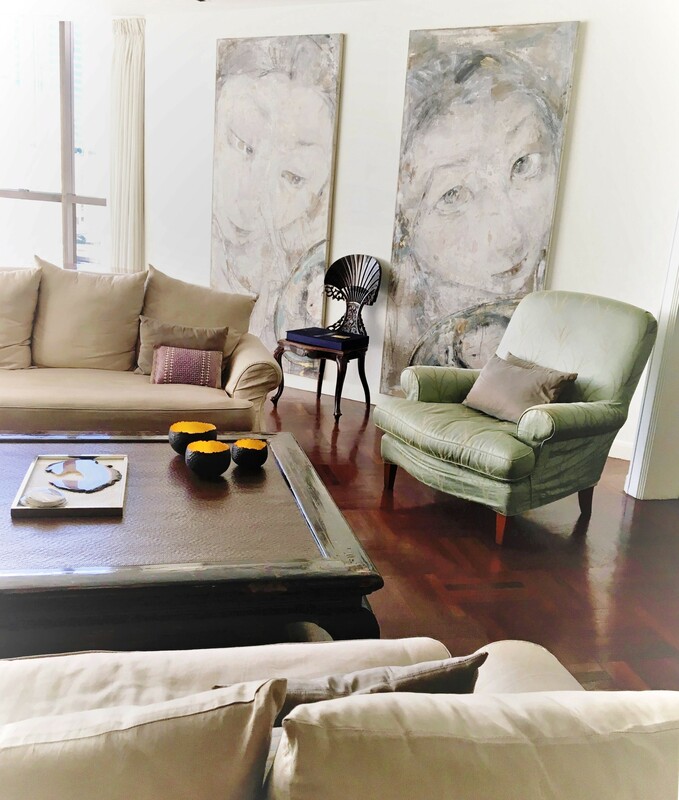 Whenever I go to Yang’s house in Bangkok, I get so much joy and excitement from looking at her latest pieces, the new batches of gems, and the trays of loose stones stacked on her work table. Yang can spend hours selecting just the right size and shape raw gemstones to become perfectly matched earrings and rings. 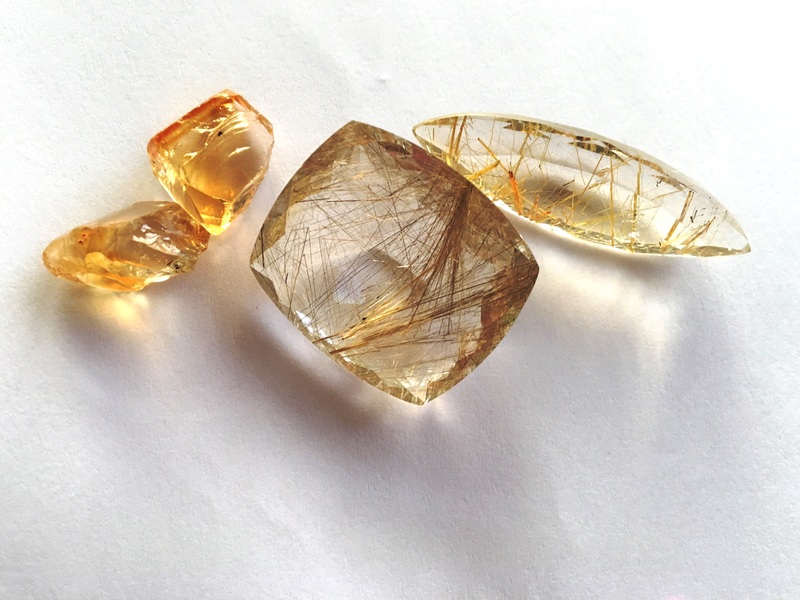 I find it both mesmerizing and relaxing poring over the stones, admiring their colours and seeing them sparkle in the sunlight, so I can easily understand how Yang can become lost for hours or days working on her creations. It’s so incredibly soothing! Sometimes, when an especially spectacular new ring arrives , I can stare at it for hours and hours, just marveling at its beauty. 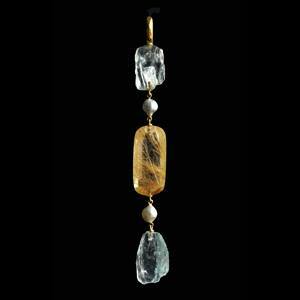 Yang’s pieces are made of raw stones in their natural shape, so each piece is meticulously paired for size and shape. This also means that each piece of Yang Riches Jewellery is completely one-of-a kind and no two pieces are ever exactly the same. She loves her creations, and sometimes becomes so attached to them that she doesn’t even want to part with them. Hey, the pieces are so beautiful, who wouldn’t want to keep them all? I’m Malaysian Chinese from Penang, where I grew up and went to school, then University in UK. I worked and lived in London for 18 years before moving to Thailand because my husband’s business brought us to Bangkok, where all our three boys were born. We’ve now been living in Bangkok for nearly 25 years! When did you start designing jewellery? I started designing jewellery after taking the GIA (Gemology Institute of America) course in 2008. What inspired you to become a jewelry designer and set up your own business? I’ve always loved jewellery. When we moved to Bangkok, I was amazed by the variety of coloured stones available here. Bangkok is a world renowned center for the gems and jewellery industry and provides wonderful access to raw stones, artisans, stone cutters and gem dealers who travel here from India, Africa, South America, Burma, Pakistan, Afghanistan and Sri Lanka – so it was a natural place to further develop my interest in jewellery, my knowledge of stones and to create my own designs. I find the natural stones very inspiring for making organic looking jewellery. 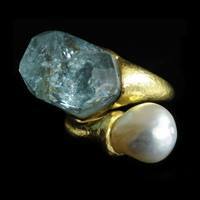 The stones with or without inclusions seemed to have a life of its own in that natural state. The process of buying raw and natural stones to turning them into beautiful pieces of jewels made me want to have my own business. What is it about jewelry that you love most? A piece of jewellery is created like a little sculpture or painting, but more intimate as it’s worn almost always on the skin. Jewellery has always been used in all ancient cultures for special occasions or worn as everyday adornments. It enhances a person’s appearance too. What are your favourite gems and why? 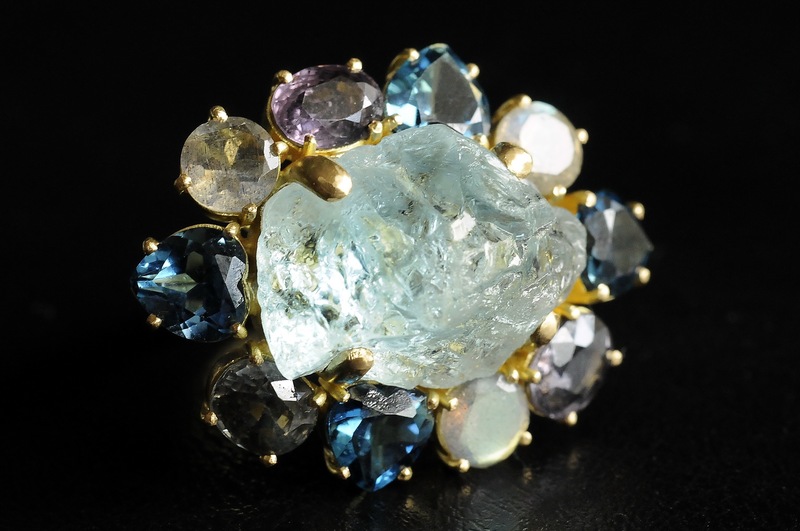 I love aquamarines, morganites, beryls, and tourmalines. Aquamarines come in so many different shades, hues, and sometimes when they have inclusions they look like little pools of sea water. Aquamarines evoke memories of the sea, such as family holidays like this with her sons surfing in Bali. Morganites are beautiful pastel pinks and peach. Tourmalines are multi-coloured ranging from black, dark grey, green, blue and browns to brilliant yellows, pinks and reds! What inspires you when you design your jewelry? The natural state of the stones can be inspirational; the thought of transforming something from nature into something beautiful that someone would love to wear inspires me. Jewellery masterpieces in progress at Yang’s work table. I can get lost for hours selecting each stone to create a matching pair of earrings, ring, or necklace. Usually I’m attracted to the natural stone and create something from it; sometimes I have an image in mind and look for that particular stone. Do you have a favourite style of jewelry? Bali, Italy (Sicily, Tuscany, Rome), Nepal, South Africa, Britain, parts of the US, India, Turkey (Istanbul and parts of the south coast). You really get around! Any unforgettable trips recently? My favourite recent trip was to South Africa to my niece’s wedding. 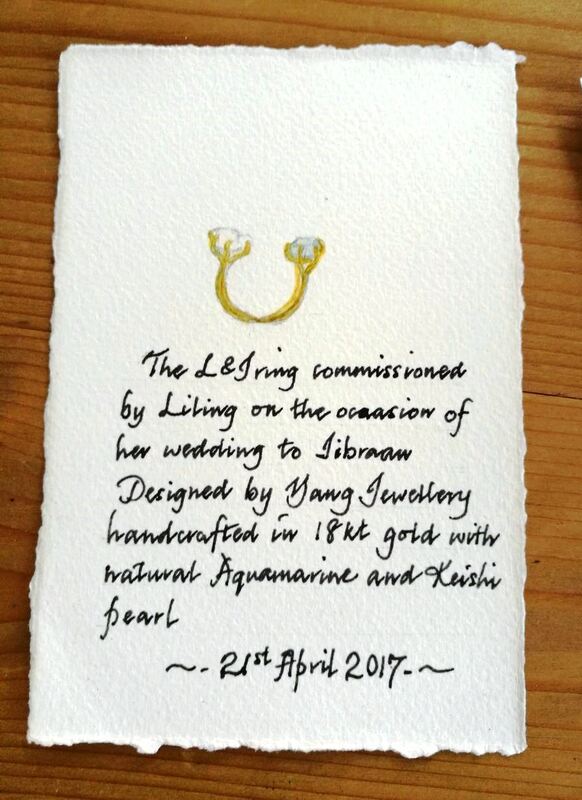 I designed and created bridesmaid’s rings which were commissioned as gifts from my niece to her bridesmaids, and each ring was accompanied by a handwritten note to commemorate the occasion. The wedding was held at a vineyard near Cape Town, with family and friends flying in from Europe and Asia, and it was absolutely gorgeous!